– Lift company in East Sussex. 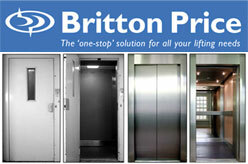 Britton Price Ltd designs, installs and maintains lifts and lifting equipment. Britton Price specialises in providing solutions for existing lifts and lift shafts where conventional lift installations are not suitable. The company has a nationwide network of service engineers that provide reliable and efficient maintenance and support services as well as a modernisation service to upgrade existing lifts.